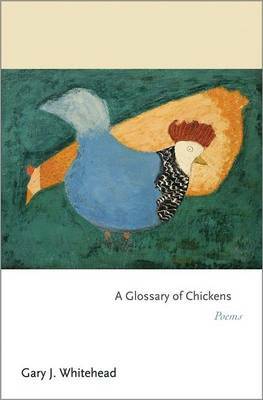 With skillful rhetoric and tempered lyricism, the poems in A Glossary of Chickens explore, in part, the struggle to understand the world through the symbolism of words. Like the hens of the title poem, Gary J. Whitehead's lyrics root around in the earth searching for sustenance, cluck rather than crow, and possess a humble majesty. Confronting subjects such as moral depravity, nature's indifference, aging, illness, death, the tenacity of spirit, and the possibility of joy, the poems in this collection are accessible and controlled, musical and meditative, imagistic and richly figurative. They are informed by history, literature, and a deep interest in the natural world, touching on a wide range of subjects, from the Civil War and whale ships, to animals and insects. Two poems present biblical narratives, the story of Lot's wife and an imagining of Noah in his old age. Other poems nod to favorite authors: one poem is in the voice of the character Babo, from Herman Melville's Benito Cereno, while another is a kind of prequel to Emily Dickinson's "She rose to His Requirement." As inventive as they are observant, these memorable lyrics strive for revelation and provide their own revelations.